What is the Peninsula labyrinth? 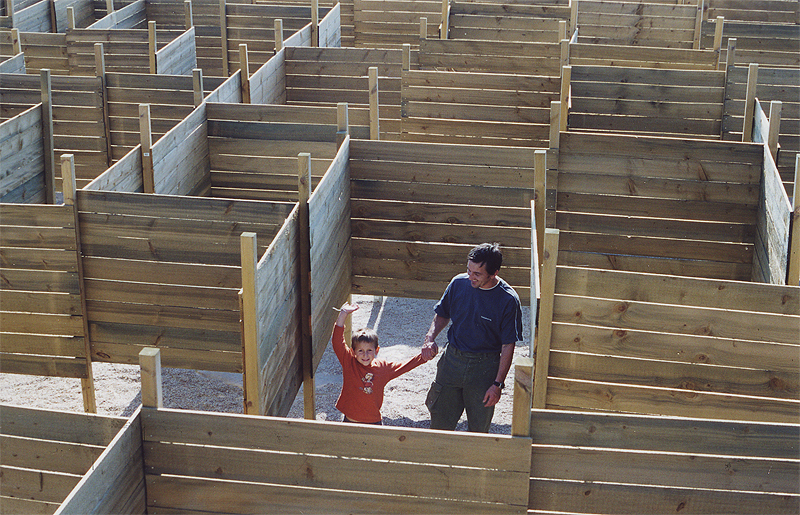 First of all, it’s a giant labyrinth made of wood, under an open sky, where you’ll uncover a local legend hidden in different parts of the maze. Each episode you discover indicates the next step to take. The rest is up to you ! Next, it’s an exhibition about the mysterious history of labyrinths from around the world, from faraway origins to today’s times. Finally, it’s an opportunity to try out other forms of labyrinths, both ancient and modern. 1) Upon arrival in Crozon, do not head for the town’s center ! (you might get lost before getting here, and that’s not part of the game ! Unless you feel like warming up first…). 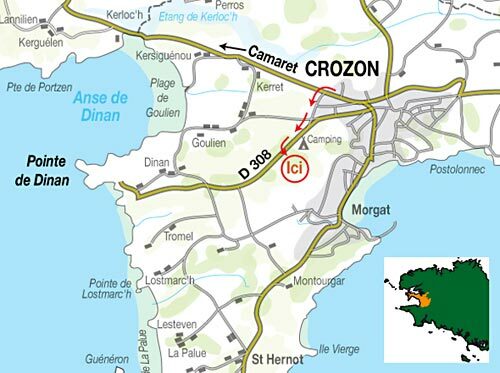 2) Follow the direction « Camaret » until you pass the Crozon exit sign. When you see the Armor Lux store, make a left. 3) Go straight ahead, then past the stop sign until you reach the last intersection. Turn right, direction “Pointe de Dinan”. 4) Follow this departmental road n°308 for approximately 1 kilometer; then, just past the « Les Pins » campground, make a left on the dirt road (you’ll see a Peninsula sign). Our parking lot is further down on the right. 5) You’ve made it ! Leave your vehicle in the parking lot and come stretch your legs and your mind in the labyrinth. Along the way, take a deep breath and admire the wonderful, natural surroundings : gorse, heath, ocean pines and a spectacular view of the superb Morgat Bay. July and August : everyday from 10 h to 19 h, non-stop. (all zones) : from 14 h to 17 h.
14 h to 18 h.
Other periods : Wednesdays, Saturdays, Sundays and national holidays : from 14 h to 18 h.
contact us, especially for group visits. Don’t hesitate to ask depending on when you’re available for a visit. Twilight sessions possible, upon reservation. Children 4 years and under : Free. Children 5 years and over; students : 7 €uros. Be prepared to pay in cash. 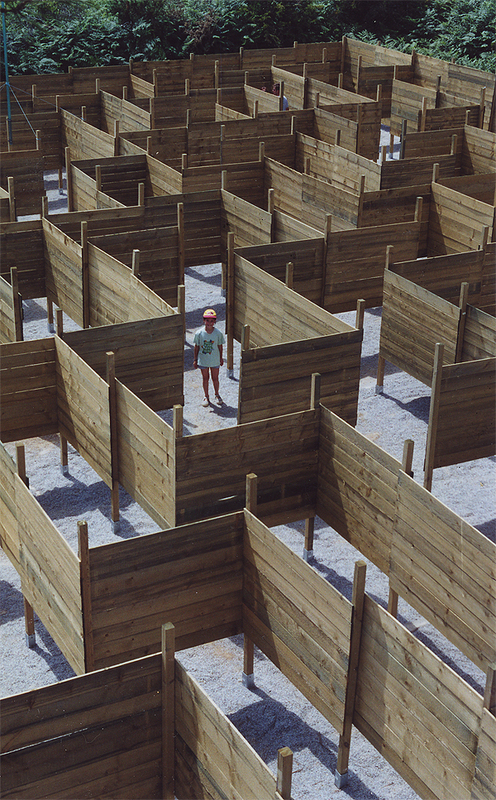 Since the labyrinth is lost in the woods, there is no telephone connection for bank or credit cards. Who comes to Peninsula ? Young children must be accompanied at all times by a responsible adult. 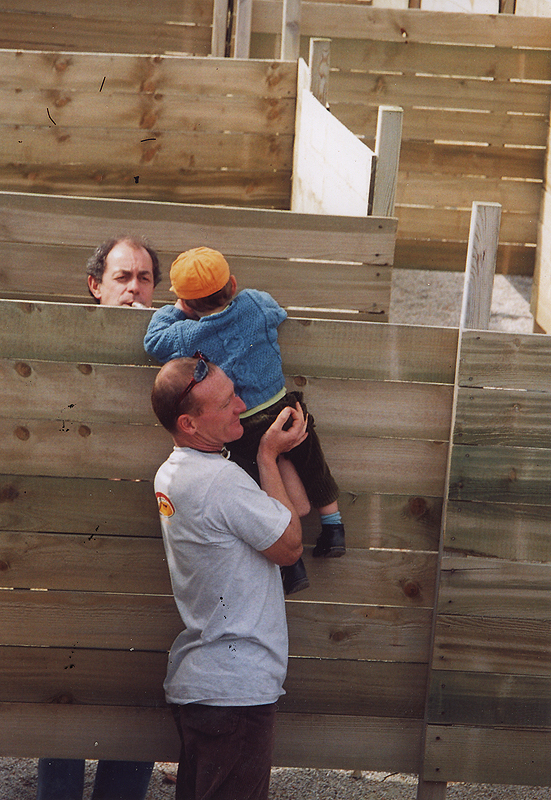 There is no babysitting on site. 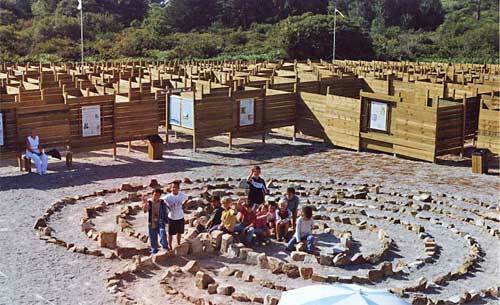 The labyrinth was designed to welcome all types of visitors, big and small. The only useful prerequisites: knowing how to read and walk ! It’s particularly recommended for family visits, because every member will find something of interest and enjoyment. The labyrinth is happy to welcome those in wheelchairs. However, they should either be athletic or accompanied by a strong helper, since the labyrinth is in the middle of nature and has gravel paths that are on more or less even ground. Better to know ahead of time ! This advice also concerns those with reduced mobility. the Minotaur can’t digest them ! Handicap-accessible toilets are located near the parking lot. The average time for a visit is about 1 ½ hours. The labyrinth is entirely non-smoking, for security reasons (surrounding pine grove) as well as keeping the place clean. No food is available on site, but in the summer you can purchase different beverages, all with the “fair trade” label. If you are claustrophobic or simply concerned about the idea of losing your children in the labyrinth, be reassured by reading the “Feel relaxed...” section. lighter clothing when it’s hot out. For young children, don’t forget hats and sunglasses as well as sunscreen in the summer, not to mention bringing water to avoid dehydration.